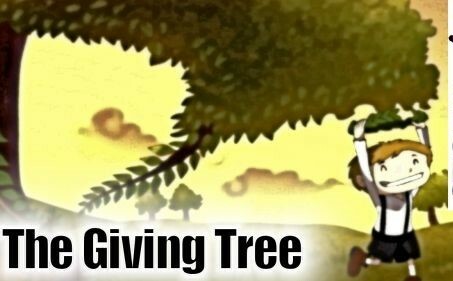 This is the awesome short story of The Giving Tree. A tall leafy tree stood on a hill warmed by the sunshine. This tree loved a little boy and its heart would pound when it heard the patter of hiss footsteps approaching. The boy would always run to the tree right after school and tell it everything that had happened to him that day. The boy liked to hang upside down among the branches and watched the sunset. The boy and the tree understood each other’s hearts and became best friends. The boy made crowns from the tree’s leaves and napped among its roots. The tree loved him with all its heart. It was happy because it knew it was loved in return. Also read, The Wonderful Musician. The tree felt that his friend was sad and asked him the reason behind that. The young man wanted to earn money but he didn’t know what to do. So, the tree suggested him to sell its fruits which would further help him in making money. The boy gathered the tree’s very delicious fruits and loaded it onto his bicycle happily. He thanked the tree and left from that place. But, unfortunately, he didn’t come again for a long, long time and the tree began to grow lonely. Then, one day, he was back. He was all grown up now. The tree rustled its leaves happily to greet him. “I’ve waited so long for you and you are back at last. Come, swing on my branches,” the trees said. But the boy only shook his head. “No, I am too busy for these games now! I have to take care of my wife. We’re expecting a baby soon,” replied the boy. The tree was really happy to hear that. It again saw the pain in the boy’s eyes. The tree laid a branch gently on the boy’s shoulder and gave him a pat. The tree was really happy to hear that. It again saw the pain in the boy’s eyes. The boy said, “I don’t even have a house and I don’t know how to raise a family!” The tree laid a branch gently on the boy’s shoulder and gave him a pat. The tree told him, “Build a house from my branches and be happy!” The boy took the tree’s branches and loaded it into his wagon. The tree watched him leave the forest to build his new house. It no longer had any branches to rustle in the breeze, but it was happy. Years went by, but the boy would not return. Every year, the tree would ask the migrating birds if they had seen him but the birds only laughed and said, “Forget about him! Human memories are even shorter than us. He’s forgotten you already.” But the tree couldn’t forget and asked the breeze instead. One day, a butterfly brought some news and told the tree that the boy is homeless. The tree was worried and wished it could do something. Then, one night, the boy came to visit. He was weak and tired and broke the tree’s heart to see him. It wanted to console him. It didn’t have its branches anymore to pat him on the shoulder, but he supported him as he leaned on its trunk. The tree was sad because it had no longer its leafy branches to shield the boy from the rain. The boy cried and said, “I am a failure. I want to go away to sail off far away from this place to begin a life somewhere else.” The tree replied, “You always try to run away!” The boy wanted a boat so that he could lie on it and see the sunshine, swaying in the ocean. The tree, without thinking, even once told him to cut it down and make a boat. So, the boy cut down the tree and made a boat to sail away in. All the tree had left was a stump, but it was happy when it imagined the boy smiled as he sailed in the boat made of its trunk. Years passed since the boy sailed away. He sailed across the ocean and around the world and came home as an old gray haired man. He saw the newly made roads, the tall buildings, the new cars and missed his tree. “My home has changed! Is the tree still there at its place?” he thought. The tree offered its stump to him and told him to sit on it. The boy realized that all his life he had come to the tree only when he desired something and the tree always stood by him. He thanked the tree from the bottom of his heart. The tree and the boy watched the sunset together as he told it about his life and they both were very happy.